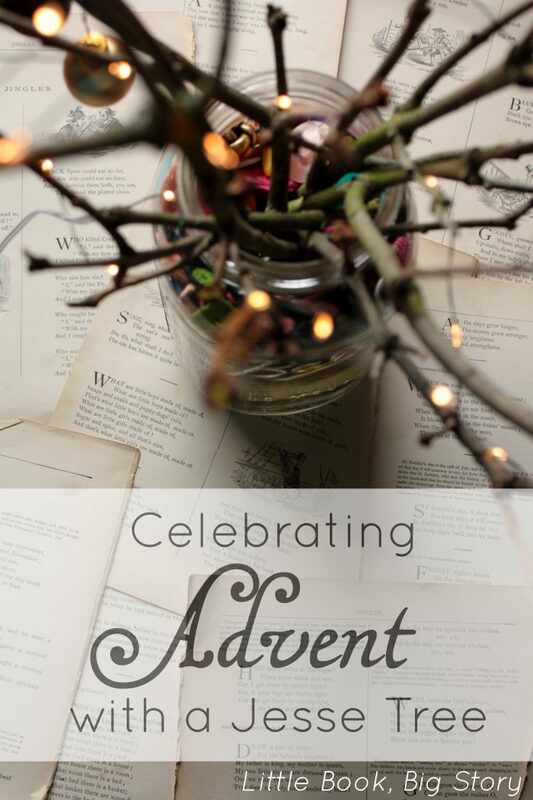 Before we get to today’s scheduled post, I have to say something a little awkward: I no longer recommend Ann Voskamp’s book, Unwrapping the Greatest Gift. 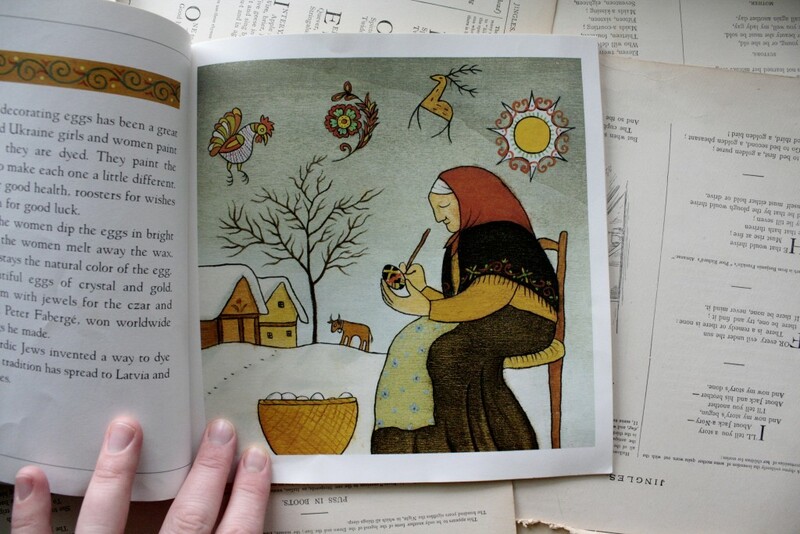 This is due in large part to Voskamp’s writing style, which seemed passable when I read through the book alone but that fell apart when read aloud with our family, as it rendered each story so frustratingly abstract that even my husband and I had a hard time following her train of thought. We also began to suspect that there were some doctrinal soft spots lurking in the devotions, but because of the author’s writing style (about which I really am trying to be gracious), we found them hard to identify and therefore hard to discuss with our children. I wanted so badly to love this book (did I mention the illustrations? ), but we were only able to make it through four readings before reaching a unanimous decision to return the book and investigate our other options. And now I find myself in the prickly position of having to retract a recommendation that I made—not once, but twice—here on the blog. 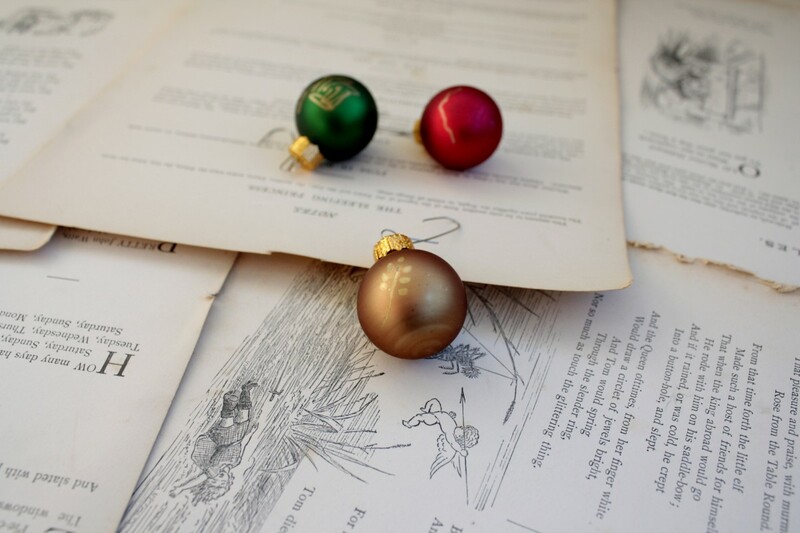 I know now that it’s not enough to read through family devotionals on my own, especially if I find myself swayed by beautiful illustrations, but that they need to be read with my family before I so much as draft a post to share with you. If any of you bought the book on my recommendation and had an experience with it similar to mine, I’m so sorry! I don’t know what afternoons are like where you live, but up here in the Northwestern corner of the continental US, they are dark. Sometimes, they are cozy dark—”stay in and make hot chocolate” dark. But the rest of the time, they’re just drippy, dreary, dismal, ready-for-bed-at-5 o’clock dark. I have lived here my whole life and despite the fact that it happens this way every single year, I still cannot get used to parting ways with the sun at four in the afternoon. But one side effect that I’m discovering for the first time this year is that it’s difficult to photograph one’s books on the front porch when the light outside is effectively that of dusk by 2 pm. The colors are weird, the shadows are weird, and the cat is cold enough to interrupt everything I do in the hopes that I might—just might—sit down so she can nest in my lap. 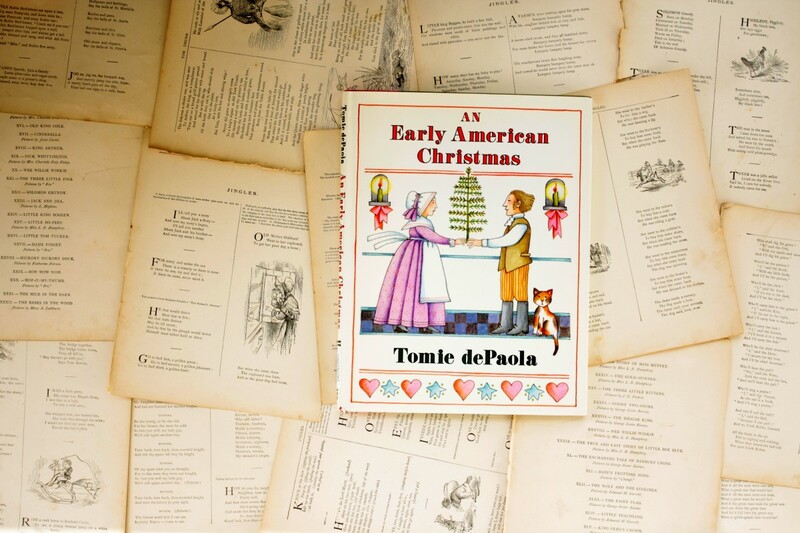 Tomie dePaola turns that early darkness into something lovely in this passage from An Early American Christmas: “As the days grew shorter, the winds blew colder. Then the snow began to fly and December was here. Soon, soon it would be Christmas.” See? This only lasts until December 22—that is what I tell myself. And then: Christmas! And after that: more daylight! 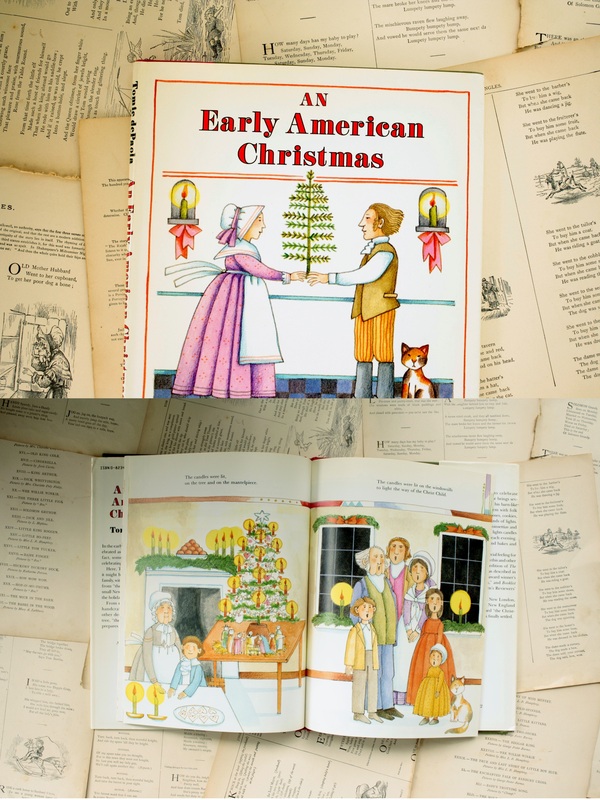 An Early American Christmas introduces us to a small village in New Hampshire where celebrating Christmas is not a thing that is done, and to a family from Germany who moved to that village and brought their Christmas traditions with them. 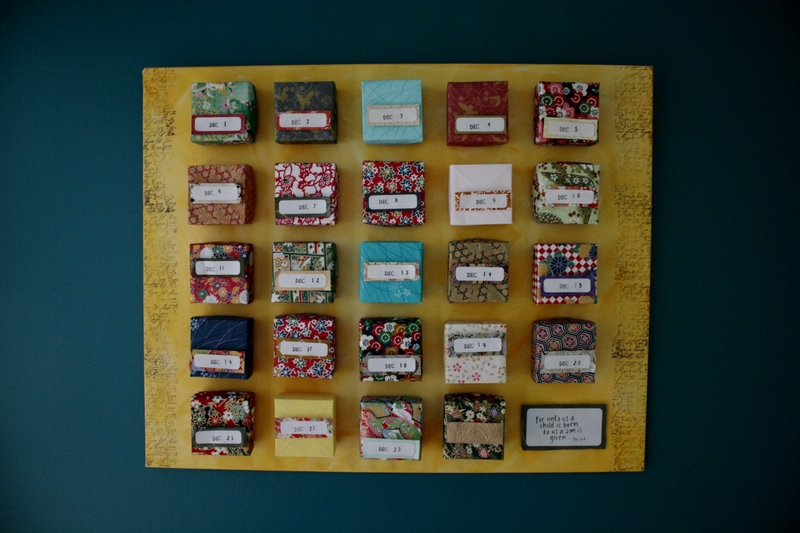 “The Christmas family” celebrated the holiday with the sort of joy that simmered over the course of months as they prepared their home for the coming festivities: shaping bayberry candles, whittling nativity scenes, choosing their tree and baking sweets, as the year moved them closer and closer to Christmas. 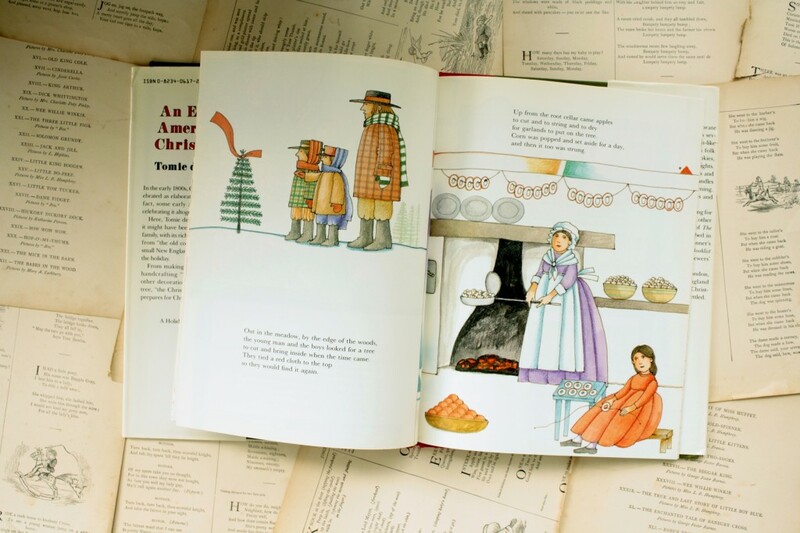 Tomie dePaola is the right sort of illustrator for a story like this, as he excels at depicting sequences: the grandmother and mother making candles moves from the top left of one page to the bottom right of the other, beginning with them picking bayberries and ending with the finished candles hanging to dry. He details the thoughtful creation of each piece of their family’s celebration in a way that stands in stark contrast to our highly marketed, factory-made gifts and decorations, and creates a sort of nostalgia (in me, at least) for a time when there was no option to purchase tacky decorations or token gifts: if you wanted something, you had to make it yourself. 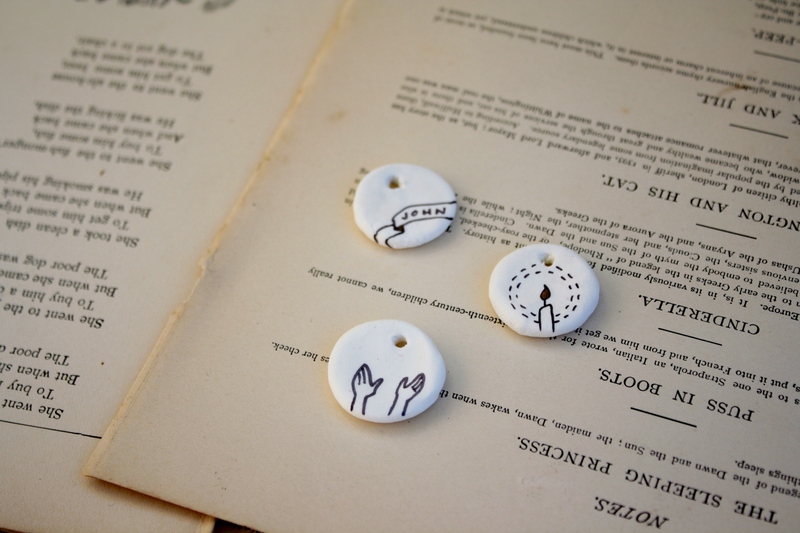 And if you wanted to give something to somebody else, you had to make it yourself. I don’t know if this book is still in print, but it is available on Amazon for pretty reasonable prices. Also, for you local folks, there is a copy in our public library (that’s where I found this book in the first place). If it seems like I’m getting an absurdly early start on reviewing Christmas books, I apologize. 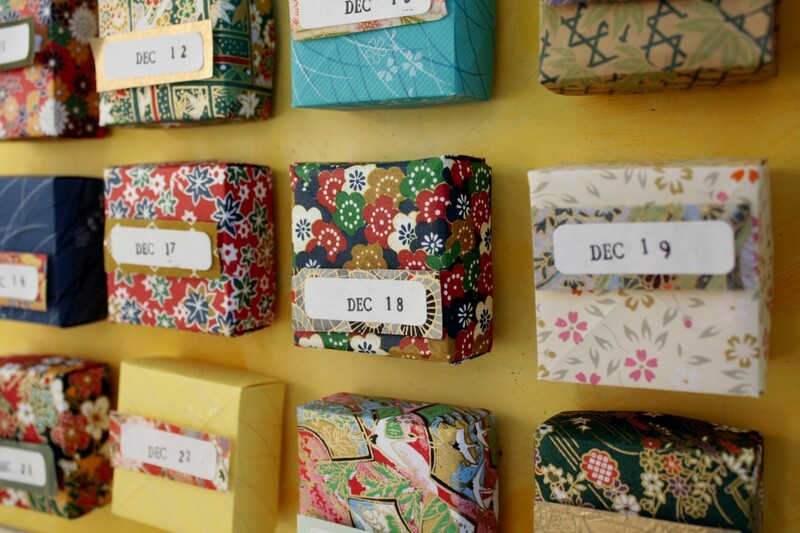 Please consider it a kindness to you, because I love finding new Christmas books and traditions but loathe finding them on December 21 and having to try to remember them by November of the next year. I wanted to give you a head start. 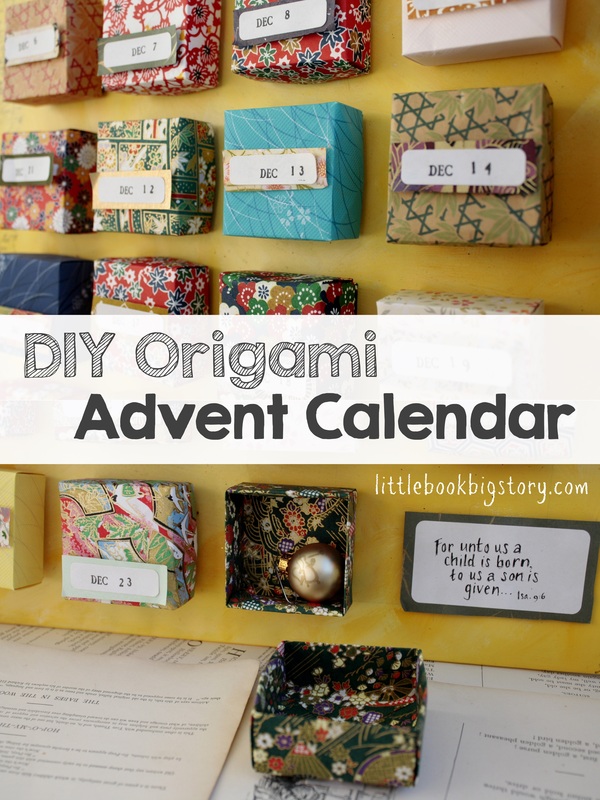 I love Advent. The hymns and prayers of quiet expectation create a counterpoint to the holiday noise of stores, streets and schedules. 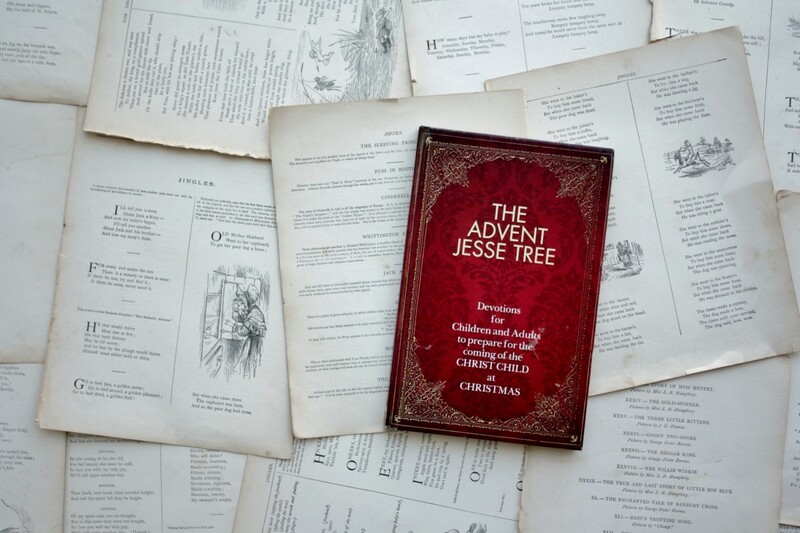 The sense that the season isn’t now, not yet, but is on its way, lends our home a building suspense, one that is marked out daily by our favorite Advent celebration: the Jesse Tree. 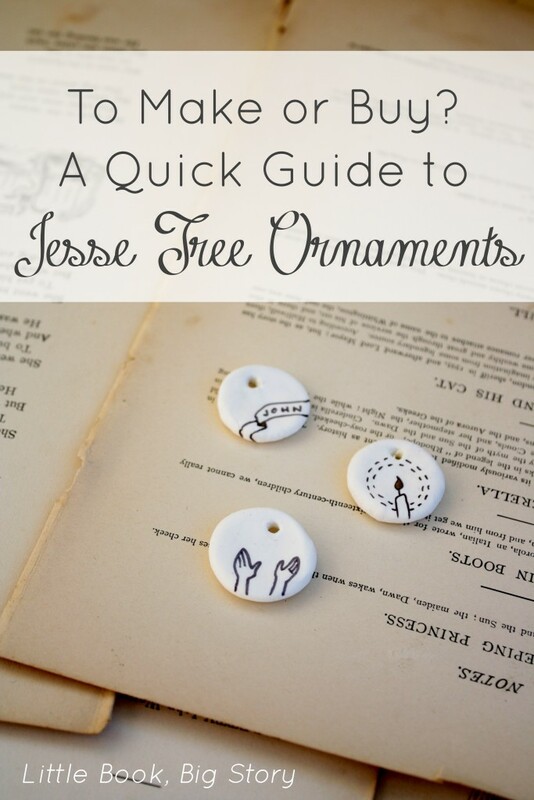 Here is the Jesse Tree in a nutshell: you start with twenty-five ornaments, each decorated with a particular symbol (I made mine with cheap ornaments from Michael’s and a gold paint pen). 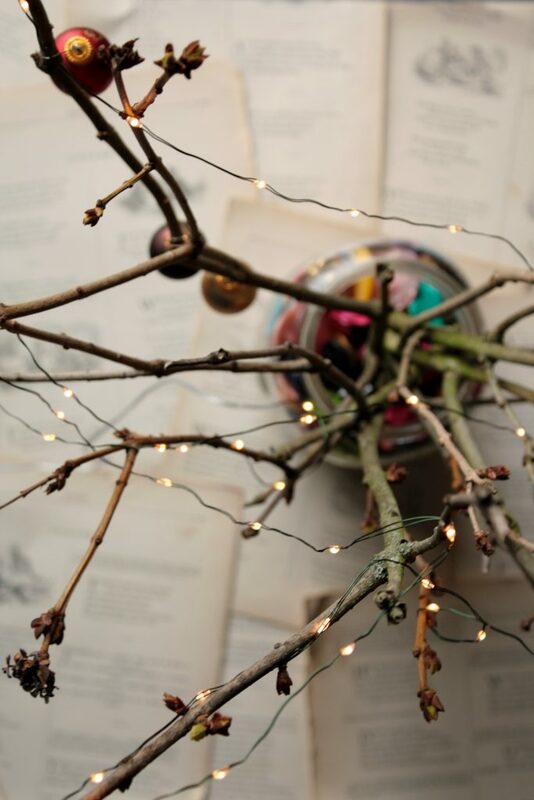 You gather a bunch of bare branches and stick them in a jar. 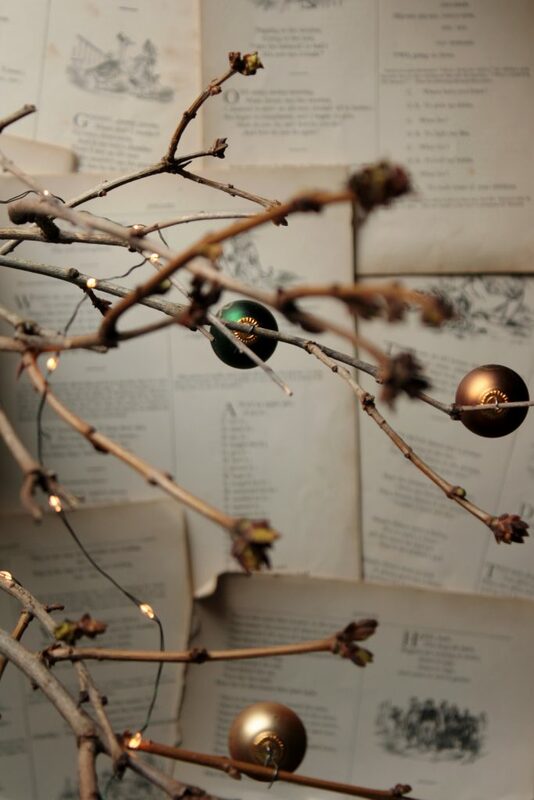 Pinterest will tell you to spray paint your branches and nestle them into a twine-wrapped, be-ribboned jar, but ignore Pinterest. Pinterest is crazy. 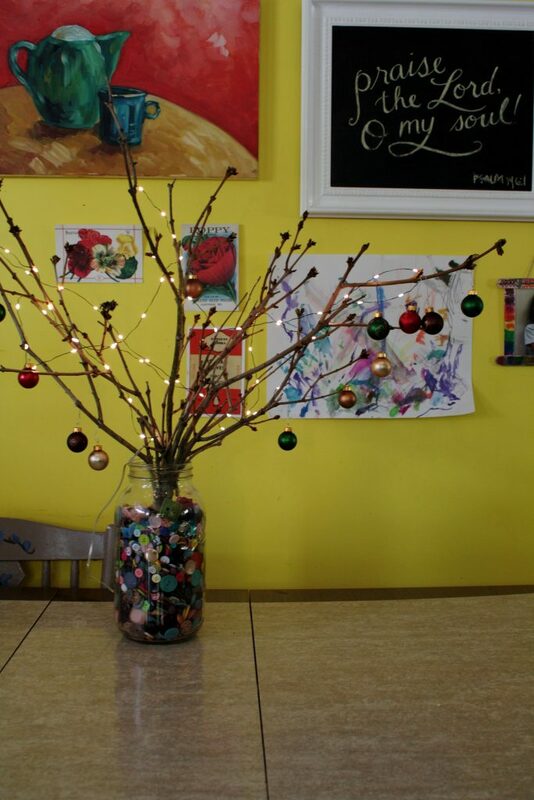 Bare branches in a Mason jar work fine. 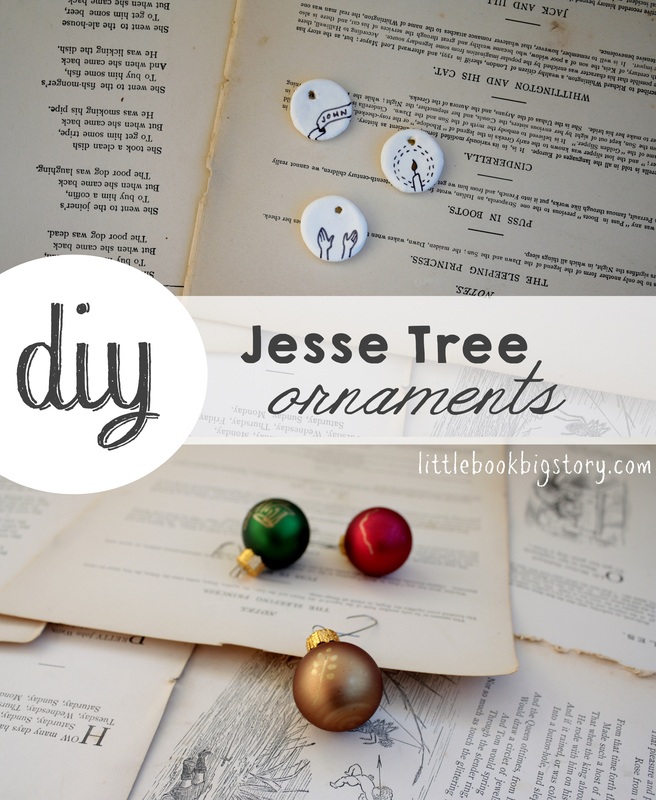 Now, for every night of Advent, read a passage from The Advent Jesse Tree, and put the corresponding ornament on your makeshift tree. Got it? Those are the mechanics of the celebration. But the heart of it is in the readings, each of which draw a different story from the Bible to its final conclusion: Jesus. 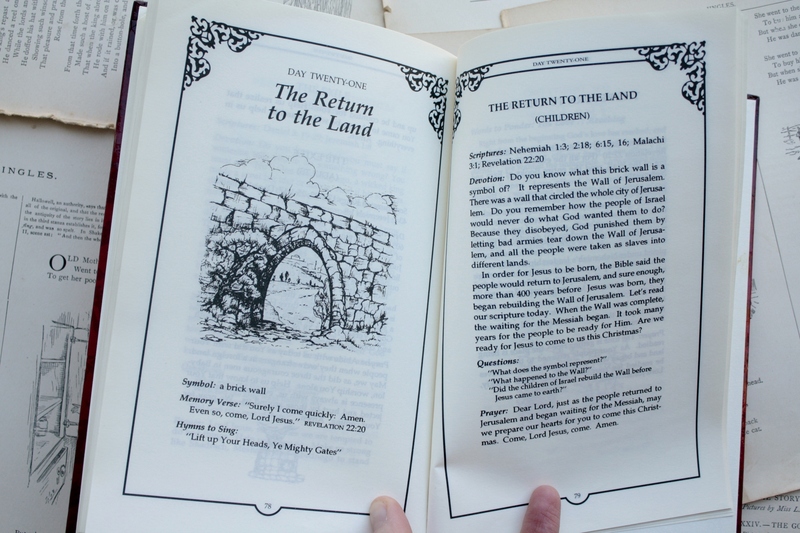 You begin in Genesis and read on to Jesus’s birth (with a peek forward into Revelation), stopping at the end of each story to remember who the story is really about. Abraham? Noah? Ruth? No. Jesus. 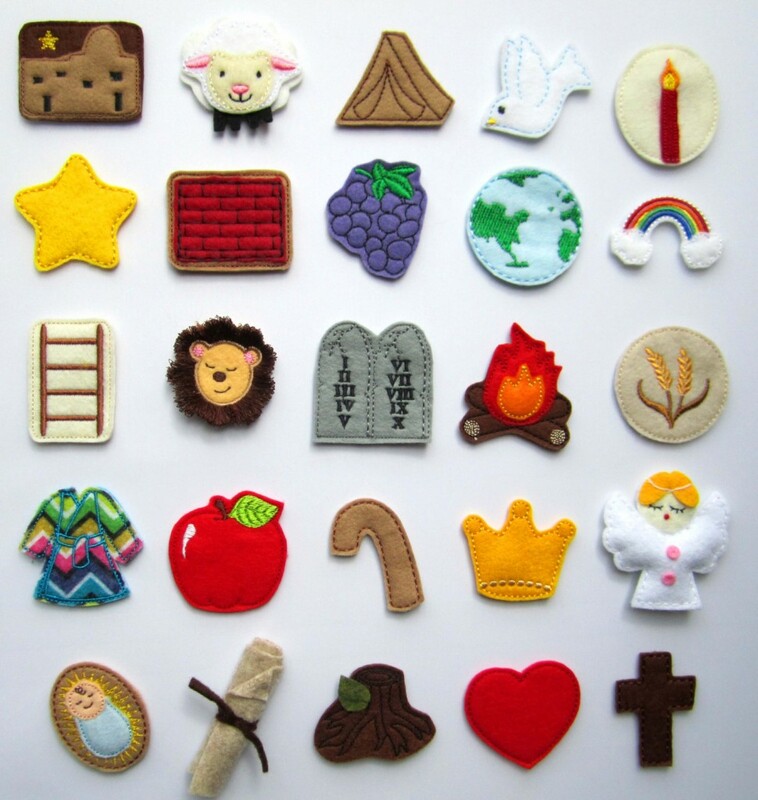 This book also includes hymns for each night, and questions for your children. There are readings for children and readings for adults, so you can customize this for your family. 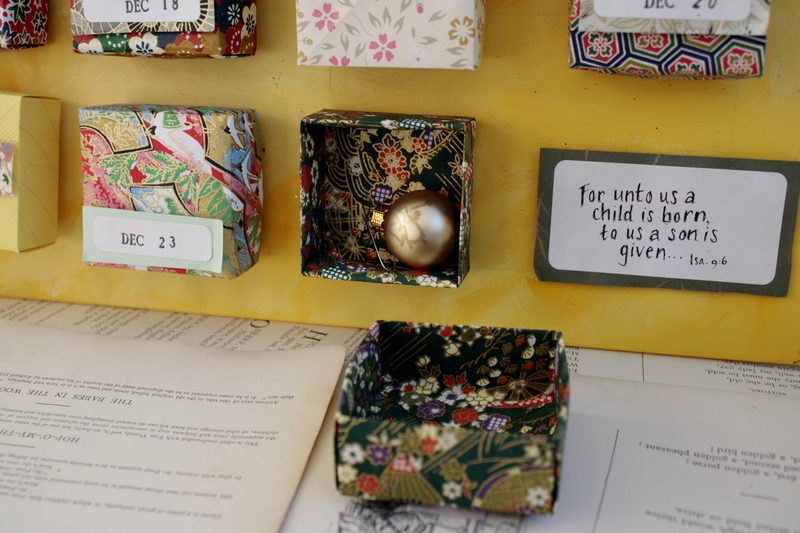 The hanging of ornaments is a simple routine (and a good one for the littlest hands), but it anchors our Advent in Scripture and reminds us that the heart of the holiday hubbub is not family, food or gifts, but the Giver of all of those good things. Every night we are drawn back to the manger to rejoice in the work that God has done over centuries, thousands of years, in bringing his plan into effect: He came down as a child, made Himself—the Creator of everything—small, so that we could be magnified in him. That is worth waiting for. That is worth remembering. That is worth celebrating. We like to give books for every possible occasion. In fact, we like to buy books for every possible occasion. Or really, I should drop the pretense and say that I like to buy books for everything, all the time, but now I find sneaky ways to do it. 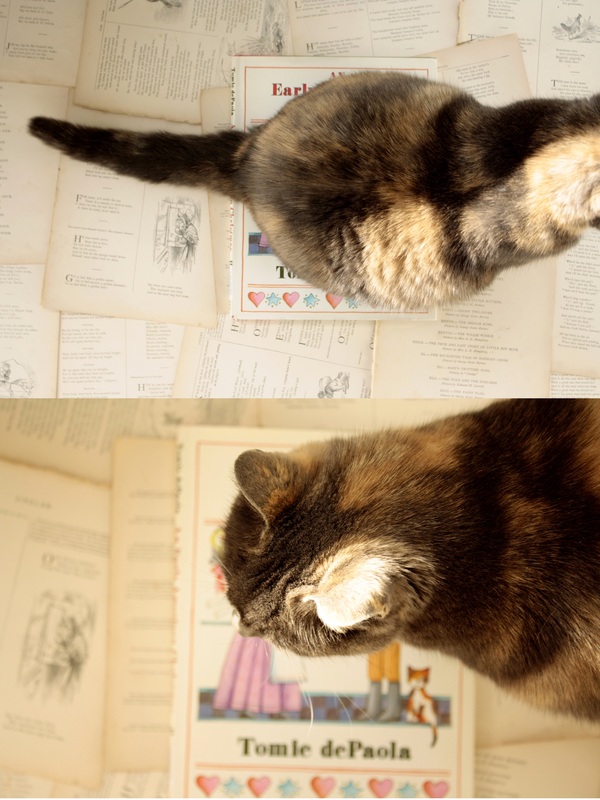 For example, we (alright, I) give each of our daughters a hand-chosen, excellent book every birthday, Christmas and Easter. But now, I also sneak a holiday-appropriate book onto the kitchen table each Sunday of Lent and Advent. Sometimes, I unveil a new book, but more often than not it’s an old favorite, smuggled down from the attic and presented for rediscovery. 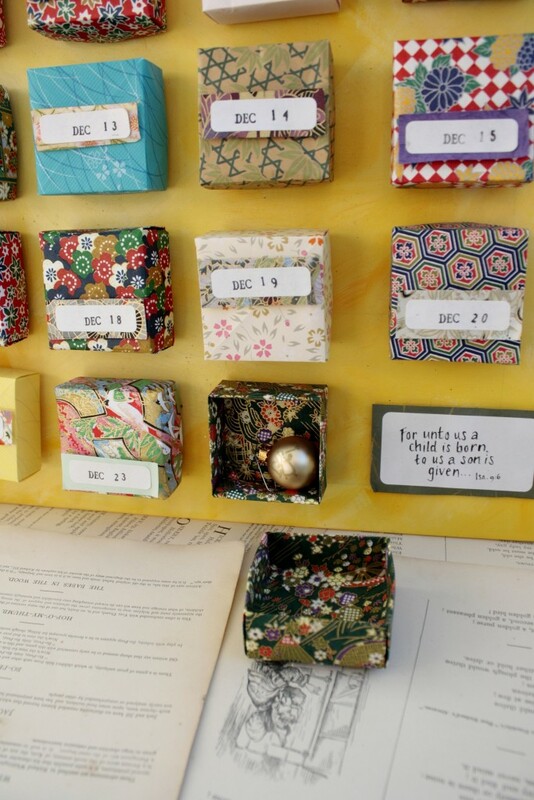 Either way, it gives us the opportunity to prepare for the coming holiday book by book, and to savor each addition to our library before introducing another. And so our library grows. 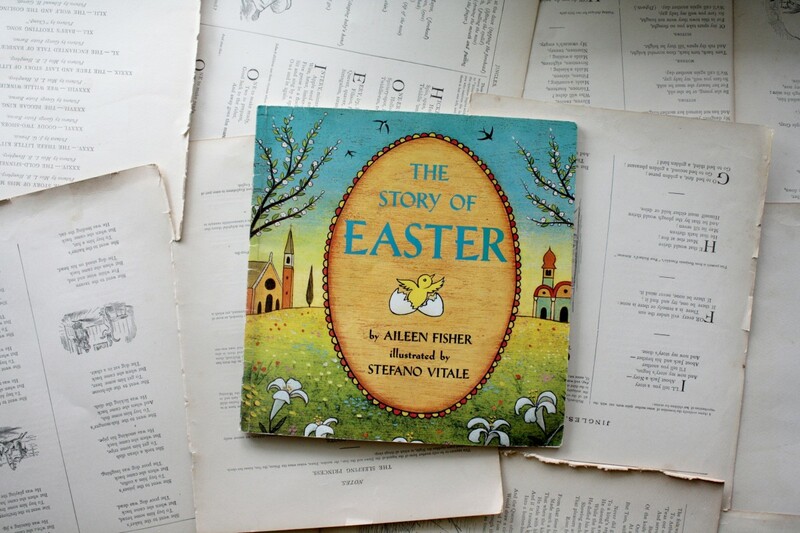 One of the first books to hit the table was Aileen Fisher’s The Story of Easter. For a minimally researched Amazon buy, it delivers admirably, and has quickly become one of the first books to reappear each Lent. Now you might think, like I did, that “the story” the title refers to is that of Holy Week. But you (like me) would be mistaken. 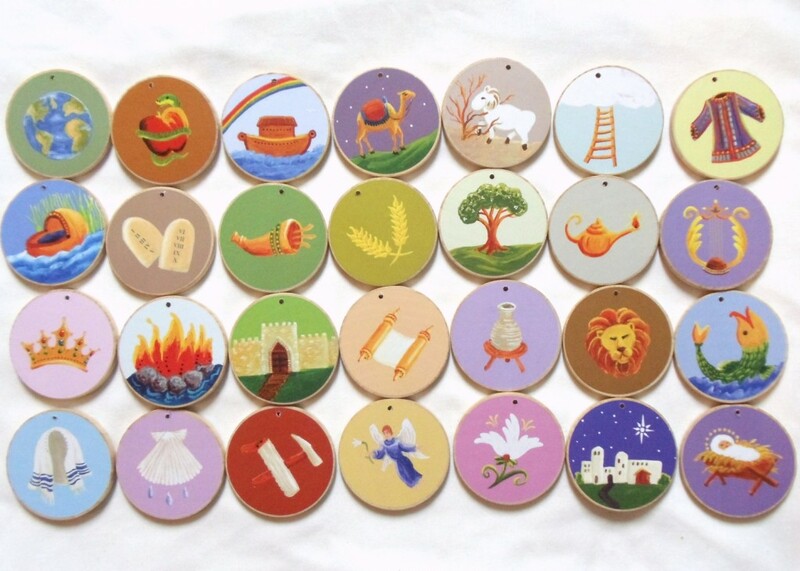 The Story of Easter refers to the story of Easter, with all its varied traditions. 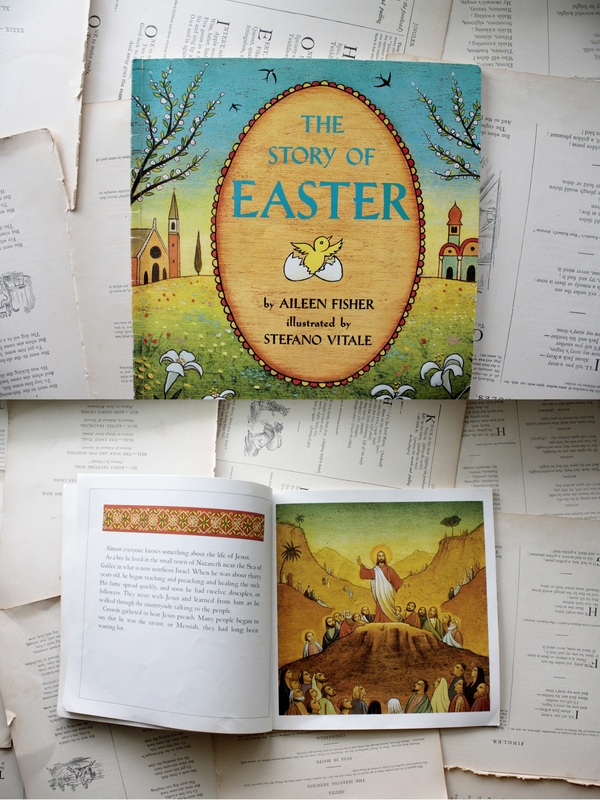 Fisher begins with Jesus, his death and resurrection, and goes on to give the history behind our many different Easter traditions, even delving into other cultures to do show where the bunny, eggs and pastels come from. She even introduced us to some traditions that we hadn’t yet met, like walks after church and the idea of intentionally wearing something new on Easter morning. 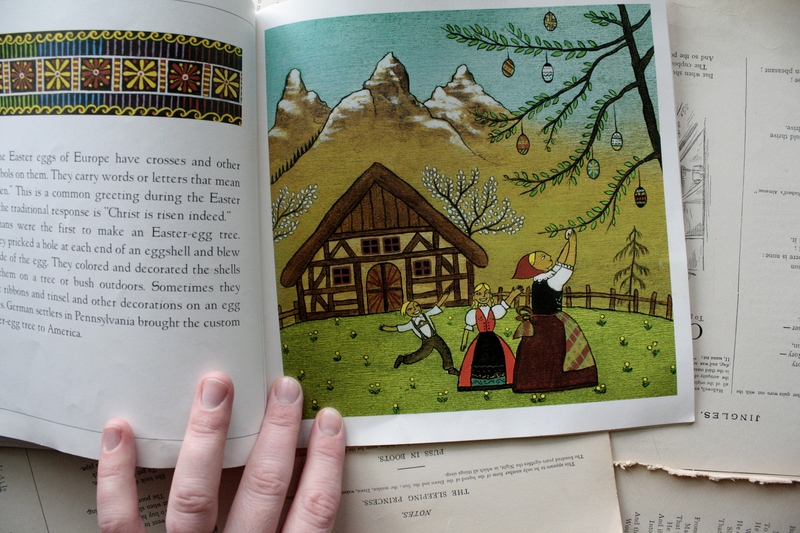 Fisher’s telling is clear and illuminating (for adults as well as children), and helps equip families with Easter’s back story without losing sight of its primary plot line. Stefano Vitale’s artwork, too, is illuminating. Vitale deftly portrays everything from Jesus’s walk through Jerusalem to Eastern European egg designs to a modern day family in a style that is brings ancient art to mind while utilizing a gorgeous, modern palette. But the fun doesn’t stop there! In addition to the story, the history and the illustrations, The Story of Easter also includes a recipe for hot cross buns and an Easter activity or two. This book has become my go-to book for explaining not only what we celebrate on Easter, but how we celebrate it, and why Easter can look so different from family to family.